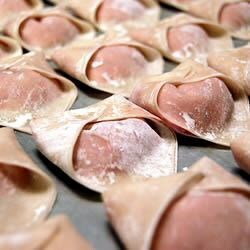 "Yummy cranberry and cream cheese filled wontons. A little sweet, a little spicy, and a little salty! A perfect snack for the holidays." In a food processor, combine the cranberries, jalapeno pepper, sugar and mayonnaise. Process until smooth. This will be your cranberry relish. Set aside half of this mixture, and pour the rest into a medium bowl. Mix cream cheese into this half until well blended. Lay a few wonton wrappers at a time out on a clean surface. Spoon about 1 teaspoon of the cream cheese mixture onto the center of each one. Pinch the corners together to make a triangle shape. If they don't stick, wet them with a little water using your finger. Set aside on a piece of waxed paper while you assemble the remaining puffs. Heat the oil in a large deep skillet over medium to medium-high heat. When the oil is hot, carefully set 5 to 10 of the dumplings in the pan. Do not over crowd the pan. Fry on each side until golden brown. Remove from the hot oil using tongs and place on paper towels to drain. Serve on a platter with the reserved cranberry relish as a dipping sauce. The sooner you eat them, the better they taste. Salsa! An inventive way to use seasonal cranberries.